Picture by Sara Woods, all rights reserved to the author. It took Stephen* two years to get to the UK. The journey began in his home country of Sudan, crossing through Libya, Italy, France and Belgium before reaching the UK where he is applying to stay. Like thousands of others, he spent several months in France and Belgium before eventually crossing the UK border, earlier this year, in the back of a van. 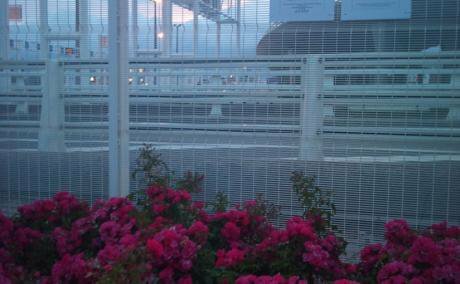 The entire UK border zone at Calais is surrounded by floodlights, 2.5 miles of nine-feet high fencing, a "comprehensive network of surveillance cameras", and drones. As well as the tasers and pepper spray described by Stephen, border guards at Calais are now equipped with guns, batons and body armour. Private companies, producing and developing the technology used at borders are making money from the perceived threat of an 'invasion' of refugees in Europe and the very real suffering of people. Many of the companies developing and promoting equipment, surveillance technologies and the IT infrastructure to track people on the move are often among the world’s biggest arms companies. The Chemring Group – supplied PMMWI (Passive Millimeter-Wave Imaging) and vehicle scanning. Roke Manor Research, part of Chemring Group, developed the PandoraTM lorry scanning system, trialled in Calais.